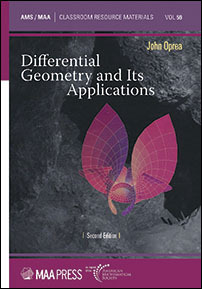 Differential Geometry and Its Applications studies the differential geometry of surfaces with the goal of helping students make the transition from the compartmentalized courses in a standard university curriculum to a type of mathematics that is a unified whole. It mixes geometry, calculus, linear algebra, differential equations, complex variables, the calculus of variations, and notions from the sciences. That mix of ideas offers students the opportunity to visualize concepts through the use of computer algebra systems such as Maple. Differential Geometry and Its Applications emphasizes that this visualization goes hand in hand with understanding the mathematics behind the computer construction. The book is rich in results and exercises that form a continuous spectrum, from those that depend on calculation to proofs that are quite abstract. … There is a good deal to like about this book: the writing is lucid, drawings and diagrams are plentiful and carefully done, and the author conveys a contagious sense of enthusiasm for his subject.